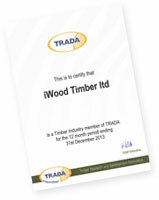 Since early 2012 iWood has been a member of the Timber Research and Development Association (TRADA). Being TRADA members gives iWood access to a wealth of technical information and knowhow that allows us to help you even more. If you have a particularly unique question or project that is outside the experience of our own timber experts, TRADA are the people we will confer with. This puts iWood in an even stronger position when it comes to helping our customers.